One of the great joys of finishing the manuscript of The Hundred Names of Darkness was that short, tantalizing gap before Prabha Mallya sent in her illustrations. I couldn’t wait to see what she would make of the second book; her art for The Wildings had astonished and delighted me when I’d seen it. Interviewers couldn’t believe that we hadn’t worked on the text and the illustrations together, but we hadn’t: with both books, The Wildings and Hundred Names, Prabha had seen the finished manuscripts and then added her artwork. But without knowing me or the cats, she had pulled the illustrations out of my imagination; I felt as though she and I had been collaborating for a very long time, as though she had seen me through the many edits and versions, even though that was not the case. When I was writing The Hundred Names of Darkness, it was Prabha’s line drawings and her collages for The Wildings that took over my dreams, so that perhaps for the first time, I dreamed (of cats and old crumbling houses and cheel squadrons) in black-and-white and not in colour. The only brief I had for Prabha, who lives in the US and had walked through some of the locations for The Hundred Names of Darkness in Delhi’s autumn, was that something of the winter chill with which the book starts should find its way into the illustrations. But when the plates started to come in, I realised that she’d over-delivered as usual. The style for the first book had been lush, images interwoven with text; this one was spare, with something of the classic brushstroke lines of Japanese art, and Prabha had managed to get uncertainty, the longing for home, friendship, curiosity, fear and love into her art, along with that background shiver from cold and hard winters. The only illustration we went back and forth over was the one about the fable cat, a traveller whose paws take her a lot further than she had meant to go. I had a tortoiseshell in mind whom we’d been very fond of, an independent stray called, with high imaginativeness, Torty; she was white-furred, splotched and dappled with patches of ginger, brown and black. Prabha’s fable cat had exactly the expression and the stillness I’d wanted, but she was black, with gold-and-brown speckles, I inferred. The fable cat spun around on my Mac as my screensaver, and I hesitated, thinking I should ask Prabha to change her colouring; and as I did my edits, untangling and unsnarling complicated plotlines, the fable cat began to grow on me. She was not the cat I had in my imagination, but she was incontrovertibly the cat from the fable that had become the core of Hundred Names. 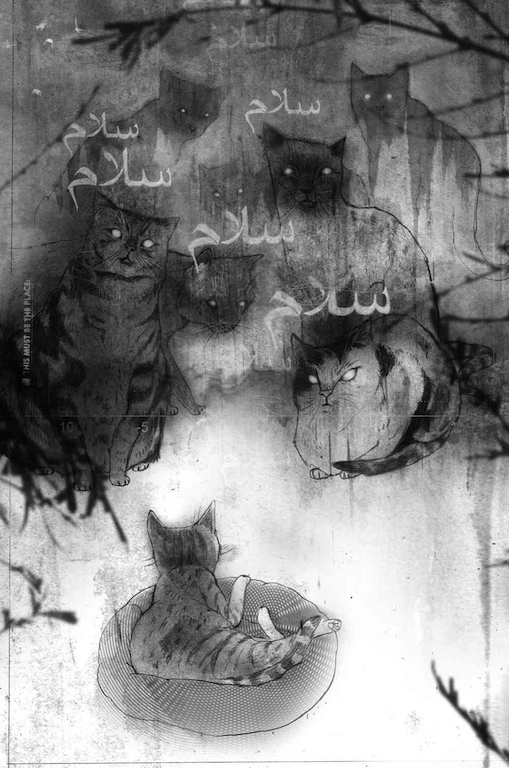 One day when I looked at the screensaver, I realised that she was the right cat, after all, and I dropped the idea of changing the illustration. Today, it’s one of my favourites from Prabha’s work, and if I was to frame just one of her many gorgeous works of art for the house, it would this one of the fable cat with the faraway look in her gentle green eyes. She was high up in the branches of the tree outside the verandah when I first saw her. Something about the way she moved snagged my attention; she balanced on even the most slender, whippy branches with the ease of a trapeze artist, but she didn’t seem to know the first thing about hunting squirrels or birds. We watched her for quite a while even though DD and I both had busy schedules that day. We were worried about the stray dogs who live in the park–friendly as they are, they might not have been kind to a stranger cat–and besides, she was a pleasure to watch. Imagine a great ballet dancer who’s the world’s worst hunter, out on a duck shoot. At one point, the little black-and-gold cat had a squirrel trapped on the far end of the branch, and instead of chasing it, she apologized to it, moving aside to let the creature pass. I got back to writing and when I looked up again, she was gone. Our two cats had stopped pointing indignantly in the direction of the tree and mewing crossly at the little stranger. DD and I agreed that there was something unusual about the stranger–her grace in the branches, her lack of alarm when she saw us–but she didn’t come back the next day and we forgot about her. Six days later, the neighbours rang our bell to let us know that one of our cats had escaped. There was a hasty cat-check, but there were the regulation two bulges under the blankets. (Our two are wimps in the cold.) I stepped out to tell the neighbours that we had no missing cats, and the black-and-gold stranger ran down the stairs, purred as she wound around my legs and asked, politely, for some food. She looked thin, and I wondered when she had last eaten. She had a small mew, but there was some desperation in it. I try not to feed stray cats or dogs, unless we’re prepared to also take them to the vet for shots, spaying and other medical issues, but I made an exception in the face of this one’s obvious need. 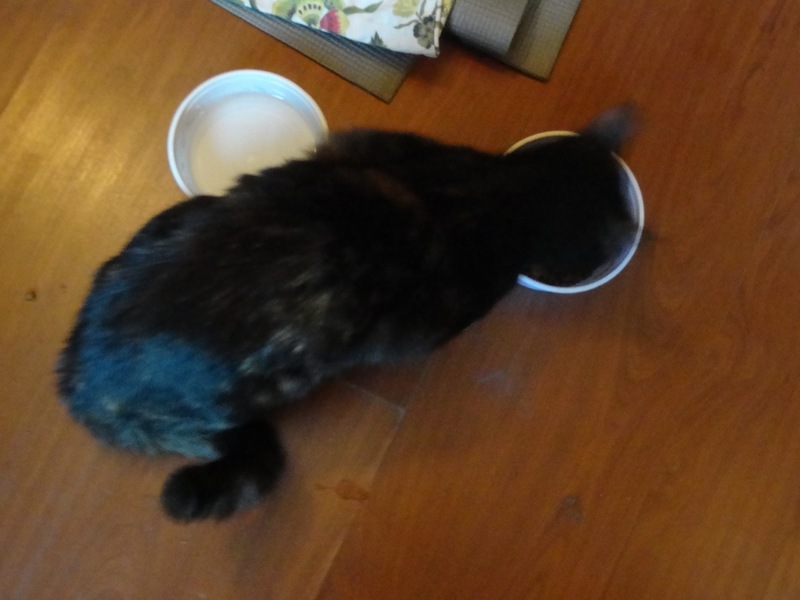 We put a bowl of kibble down and started to retreat, assuming that like all strays she would be too scared to come to the bowl on her own–but she ran up to us, winding around our legs, and hungry as she was, she did the feline equivalent of offering a thank-you head rub before she ate. She emptied the bowl and tried to walk back into the house with me. I said, no, we already had two cats, weren’t looking to adopt another; and what if she already had an owner? She took it well, and though her eyes signalled disappointment, the stranger disappeared down the stairs. That evening, the neighbours called again, and then again, to tell us that “our cat” was sitting outside. It was too late to take her down to the animal shelter. I went out to talk to the stray and to explain that we already had cats. This time, she seemed desperate in a different way all together. She butted her head against DD’s legs and mine, trying to explain something. When the dogs barked outside, she shivered. It was a freezing night. She didn’t try to push past us into the house, but her green eyes were large and appealing. I picked her up and she purred, turning, and we saw the deep wound in her flank. Small, starving, scraggy: Lola on her first day. Within a day, we’d begun to realise that there was, indeed, something unusual about the stranger. She was remarkably friendly, operating on the assumption that all humans were wonderful people who loved cats and who would love her; she had none of the wariness of the street cat, and yet, she didn’t seem to understand houses very well, treating doors, windows and book cupboards with grave curiosity. This friendliness was dangerous; it could get her killed, and she was so thin it was obvious that she hadn’t been very good at hunting down her own food. 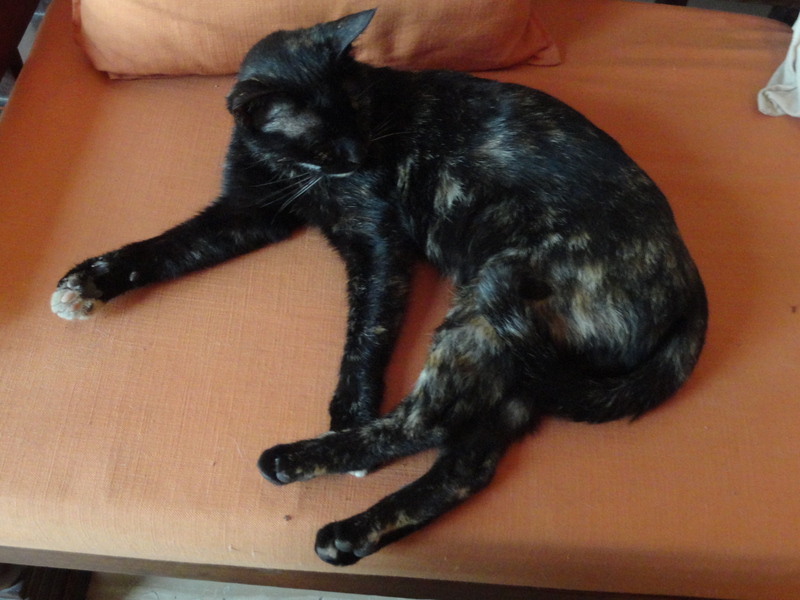 By the end of the day, my staff–the housekeeper and our office help–had decided that she belonged with us. Dr Chaggar, who’s taken care of every single one of our waifs from off the street with the same meticulousness as if they were pedigreed descendants of Bast, stared at her when we took her in to be treated. She had handled the 45 minute drive with none of the hysterical mewing and scratching with which many cats react to cars; she had allowed herself to be picked up and cuddled by an unknown vet. When he cleaned out her wounds–this was palpably painful–she flinched, and asked him to stop, but instead of biting him or moving away in fear, she leaned against him in complete trust. “I’ve never seen an animal behave like this,” he said. Neither had I. Silk stockings and black gloves and as many poses as a Vogue model. We are still punctiliously asking around the neighbourhood to see if anyone’s lost their cat. But every day, this one becomes more and more a member of the household; right now, she’s out on the balcony, chatting with a mynah in a way that puts the feline reputation for being ferocious predators to shame. But if any cat could make friends with all the world, this one would. The little stranger with the dancer’s legs has a name, borrowed from the song Copacabana: Lola Kitty. 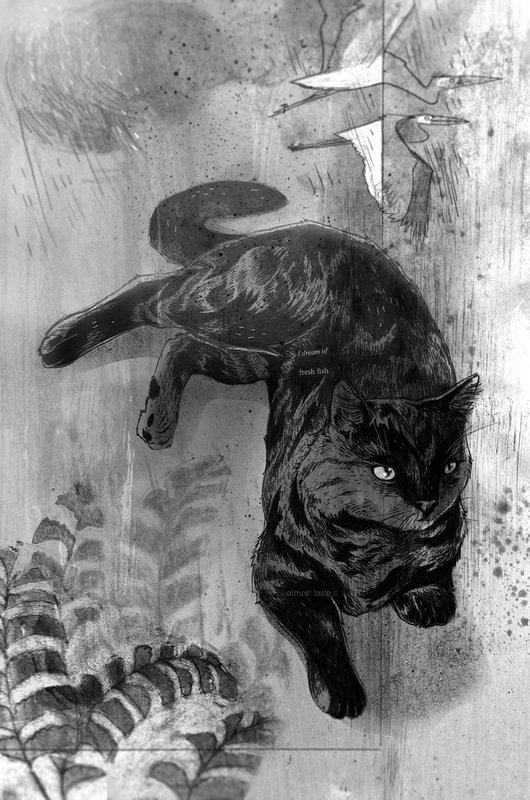 Sometimes I look at Lola and then at the illustrations in The Hundred Names of Darkness and there is a funny wobble in my stomach, because it feels a little as though the art from the book decided to march up the stairs with its tail held high, mewing to be let in to our home. (This is not such a good thing. The book contains bandicoots, rats and tigers, two of whom would be unwelcome in our house and one of whom would probably not fit.) For the moment, though, the fable cat is home from her travels. I hope Lola, this unexpected New Year’s Eve gift, will decide to stay. I feel The Wildings resonate in my heart. I read it intensely, deeply, many times in the first two weeks I had it. I just finished it again as my own little one fell asleep on the blanket. Thank you, thank you! In the back of the book, printed in 2012, it said “the riveting sequel and conclusion to The Wildings, will be available July 2016.” But I find references on the Internet that the second book was printed in 2013 or 2014. Is that correct? And I found a neat question-and-answer interview you did with the New York Times in 2012 where you said it was going to be a trilogy. Is that still an option? Is the third part what’s supposed to come out In July? Thanks so much for this, and I love the thought of you reading it with a cat by your side — that’s quite perfect. The Wildings originally came out in 2012 in India, and the sequel, The Hundred Names of Darkness, came out in 2013; these editions, beautifully illustrated by Prabha Mallya, were published by Aleph but weren’t available outside the Indian subcontinent. The US/ Canada editions came out in 2015 and 2016; the UK editions were published this year within six months of one another. I’d been thinking of a third book, but it’s on the backburner for the moment because I’m working on a very different novel. If I do come back to the world of the cats, I might do linked short stories instead of a novel. A character you’ll meet only at the end of The Hundred Names of Darkness has been tugging insistently at me, demanding that her exploits be taken seriously. It may take some time, but I hope there’ll be a third book some day.